The help button opens up the CellSmart POS help Forum and blog which allows you to search through many articles explaining the features and options in CellSmart POS. Chat now: You can chat with our consultants online. They will provide you with assistance and answer any questions you may have regarding the software. Download Support Software: To download the support software click on the support software button and the download for Teamviewer software will initiate. View your pending tasks by clicking on the pending tasks button. The pending task window allows you to create new tasks and mark them complete. The battery icon will tell you how many days you have till your software expires. By clicking on the icon, it will lead you to the CellSmart POS login portal, where you enter your username and password to access and view your account information. Spending: How much the customer has spent in your store. 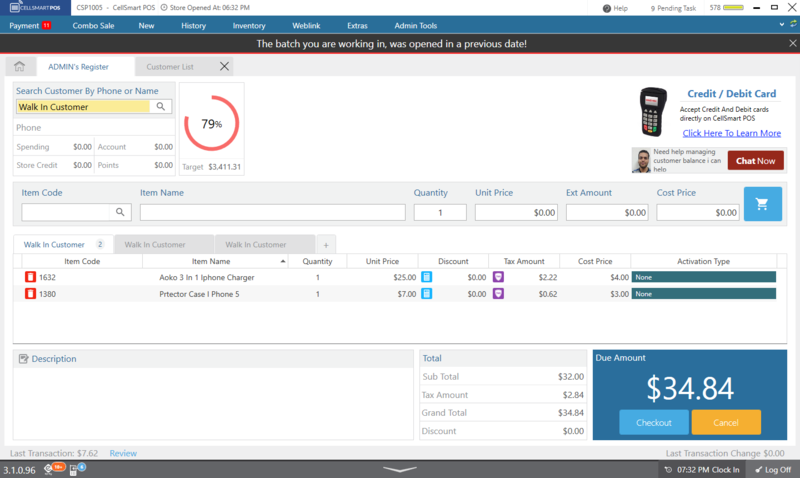 By Clicking on spending, a report will be generated showing the customer's transactions. Points: How many points the customer has accumulated. The target light's purpose is to let your employees know if the store is the minus (red), breaking even (yellow) or making profit (green) for the day, without revealing actual dollar amounts. The smart visual display works great in motivating employees at better selling to reach the green light each day! CellSmartPOS Reports: When the target light is clicked, it will show the current Batch Profit and loss report of all the categories that count towards the target light. For example, itemized items, payments, serialized items, services and etc. This report can be viewed anytime, however, it is not viewable for employees in the store by default but can be viewable after changing their user rights. The item code bar allows you to search for and sell items in your inventory, products that you've created, payments that you want to add to your transactions, services and etc. You are able to type in anything in the item code bar and it will return you with items that are related to your search. If the item name you entered is accurate, it will ring-up the exact item from your inventory. If not, then it will present you with a window of related items to your search. Once you select your desired item from the window, it will ring-up that item to sell. Item Code: The item code allows you to enter an item code, name of a product, service, or any item that you are able to sell. Item Name: The item name shows you the name of the item you selected. Quantity: The quantity is the amount of the items you are selling. i.e if you're selling 2 cases you will change the quantity to 2. Unit Price: The unit Price is the selling price of an item. Ext amount: The ext amount is the total amount of the products that you added. For example, if you are selling a $2 case and later change the quantity to 2, the exit amount will change from $2 to $4. Cost Price: The Cost price is the original price of the item when you purchased it from a vendor. Shopping cart Button: Pressing the shopping cart button will shift your product to the invoice, finalizing it for sale. This allows you to take multiple customers at the same time. You can check out many customers from the same window by clicking on the plus icon. Discount: The discount option allows you to give your customers a percentage or a fixed discount. you can enter the amount by clicking on the small calculator icon and select the percentage or dollar sign for a percentage or a fixed amount. Activation Type: The activation type tells you the type of activation you select when selling a phone. For example, you can select from new activation, upgrade phone, port in, or just the phone. In the description box, you may enter any additional details regarding the sale you make. This will not be printed on any receipt and is only viewable by the user. The total box provides you with a breakdown of the total amount of the sale. Subtotal: the subtotal gives you the amount of the sale excluding any taxes, or discounts. Tax amount: The amount of taxes that were applied to the sale. Grand total: The Grand total is the total amount of the sale including taxes and discounts. Discount: The amount of discounts on the sale. 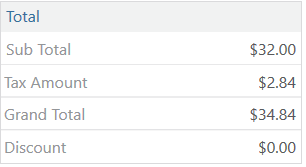 The Due amount tells you the total amount due for checkout. You are able to cancel or check-out any sales that are not finalized through the Dashboard. Tells you the amount of the last transaction that was made through the software. By Clicking on this button, the software will show you the list of Epay pending bill payments. By clicking on the software version, the update log will open your browser, and lead you to the CellSmart POS update log where you can view details regarding each update of CellSmart POS. The Clock in button allows you to clock-in to the software as well as clocking-out. The Log off button allows you to log off from the software. To log in back, you may enter your username and password.